We studied in Ontario, Canada for about three months. We went to Great Lakes Christian High School and took classes with local students. During our stay in Canada, we had a lot of valuable experiences. 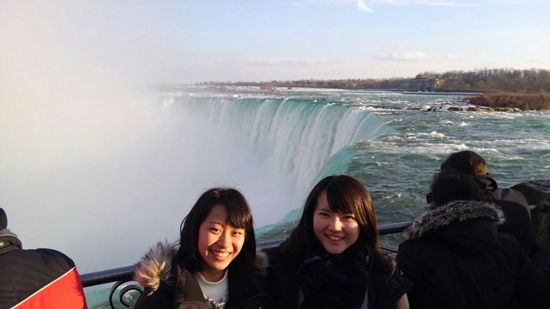 On January 23, we left Tokyo for Toronto and met our guardians. They welcomed us warmly and we stayed in their house for the first two days. After that, we finally met our host families and teachers who would be taking care of us in school at a café near the school. We introduced ourselves, talked about the subjects that we were going to take, and then got on a bus to go to a retreat - a spiritual camp. About fifty students and teachers went to the retreat and they were so friendly and kind to us that we enjoyed our time with them a lot, skating on a lake, sledding on a snow field, chatting and eating. After every free time, we all gathered together and deepened the relationship with God through prayer. After the camp, we went to our host families' houses and spent the first weekend with them. On Monday, we went to the school to choose subjects. Both of us took ESL and drama class, geography (in different classes), career studies, and gym class. We had 80 minutes in one class which is longer than our school in Japan and we also had chorus or Bible class between the first and second period. In ESL class, we learned basic English grammar, practiced writing short essays, edited them and so on. 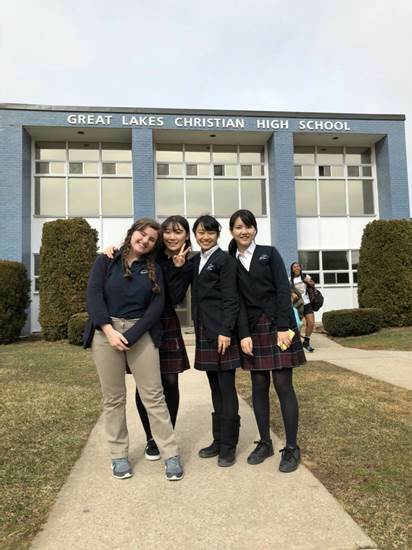 In drama class, we played some games to warm up, acted part of a play, made our own stories, performed monologues, and did many other things that we would not be able to experience in Japan. In geography, we learned about Canadian landforms, provinces, and climate. In career studies, we could learn practical things for the future such as finding an occupation or how to write a resume. In gym class, we strengthened the relationship with our friends as we played basketball, volleyball, badminton, and hockey. There were only eight to fifteen students in every class room, so we could easily ask a teacher or friends about things which were hard to understand. This school accepts a lot of students from many different countries so it was a very cosmopolitan school. In addition to school life, we took part in many activities. One of the host families was Christian and the host parents were teachers at the school, so every Monday night, we met some friends and sang Christian songs together. We went to a church every Sunday as well. During the long weekend in February, we went to Toronto and did some shopping, had lunch, watched a very exciting game with our friends called 'Medieval Times', and had a really good time. The most wonderful experience was the chorus trip in the USA. It was for a whole week and about twenty students attended. 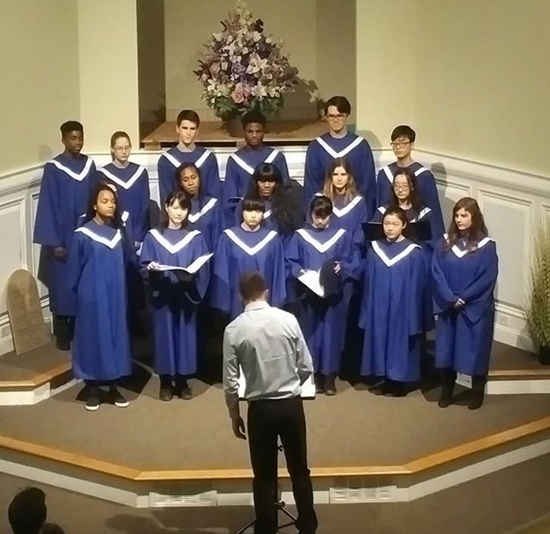 We left for the US by bus and visited many churches to sing in concerts and services. We did not only perform, but also enjoyed shopping in a giant mall, visiting a water fall and a famous theater, staying in a big house, playing table tennis and billiards with many friends. As we spent those seven days together, we could get much closer to friends we had not known before so it was such a great opportunity for us. Both of our host families were very kind. One was a family of six and they accept a Toyo Eiwa student every year. They taught us many kinds of card games and we had a happy time. They also took us to many places on the weekends, such as Niagara Falls, Sugar Bush, a library and their grandparents' houses. The other host family had a really cute baby girl who was only six months years old. We played with her and cuddled her and spent a really good time together. We were so surprised at the speed of the baby's growth. On weekends or after school, we enjoyed cooking with our host families, playing basketball, having lunch at Canadian restaurants, visiting relatives and chatting together. We could have an unforgettable time and it was one of the best experiences in my life. On March 30, we said good bye to such wonderful host families and guardians, and left Toronto airport. We had experienced so many things that we would not be able to do in Toyo Eiwa, or in Japan. This experience gave us confidence, especially through communicating in English with many foreign friends. It was also a good opportunity to broaden our minds and think about ourselves as Japanese. Everything was so meaningful for us even though it was only three months. We really appreciate everyone's support; teachers in Toyo Eiwa and Great Lakes Christian High School, our guardians and agent, friends and host families in Canada who gave us this great opportunity, and God who was always with us.